or browse & buy selected originals and prints at Saatchi Online. I am also happy to schedule studio visits, and to arrange loans of framed work to local organizations. My style and chosen media evolves over time. I am a mixed media artist with a current emphasis in drawing. I work with a variety of media, and have a great interest in both mixed media drawings and printmaking. I often use assembly in my process, and include digital painting and manipulation in my process for collage pieces, and also to visual next steps for a final work. I enjoy the layering and combining that is intrinsic to print making. I appreciate and use the element of surprise in my work: sometimes the inspiration and true subject of a piece becomes clear only when the work is complete. Why do I make art? What am I trying to do when I work? I have always been immersed in art; my grandfather was a painter by profession and I liked to draw as a child. However I did not enjoy art classes and abandoned a college art major. 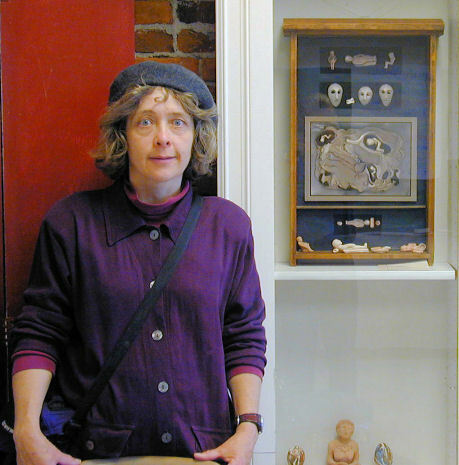 Making things was an occasional hobby until I moved to Port Townsend in 1998, when making art became part of my daily life. I make art to please myself, but my best work must be shared: it is truly a form of communication. I hope to capture your attention and take you somewhere else for a moment. I want to take you to place I have spent many hours creating, and to share the sense of wonder and mystery I feel while I work. I become totally absorbed in the process of making things, in the logistics of assembling, printmaking, painting or carving. I am truly addicted to this, and even to the inevitable frustrations along the way. Overcoming obstacles contributes to the ultimate satisfaction. But process is not enough; I also want to create satisfactory work! I must want to hang it on my own wall. Ideally my art will evoke a story, an emotion, a mood, or create a sense of surprised recognition. It should spark the imagination, cause you to see something in a new way, evoking a memory or an emotion. I want to create art that does this for me, and I hope you will experience this also. There must be nothing out of place, or inconsistent with the whole of the piece. If your eye is distracted by an anomaly, you will not experience the piece as a whole, and as intended. Sometimes it takes a long time to adjust the balance and tensions in my work. Ultimately, I look for both a surface level aesthetic, the products of color, line and form, and also something more illusive that will draw my interest, and hold it over time. How do I know when a piece is "done"? I cannot readily explain in words how certain combinations of images and objects come together to create something more than the sum of the parts. I don't want the emphasis to be on the analysis; I want the art work to communicate visually, and to go beyond words. Occasionally the act of creation is almost magical: I am caught up with excitement, the ideas and the materials mesh together, and I just stop and look, and know! That is wonderfully satisfying. More often, the work seems to hold promise, yet lack the magic. I may set it aside, but in plain view, for days, weeks, or even months. I may experiment with ideas, trying various combinations. I may seek advice. I may find the piece complete when I can enjoy letting my eye linger without being distracted by any one part; when I am satisfied in stopping to consider it in passing. If that does not happen the work may be retired to the collage "parts" drawer. Art has always been important in my life. As a child, I took drawing requests at school, particularly for drawings of fairies (OK, I was a CHILD!) My grandfather, Robert Sivell, made art a lifetime career, painting in oils and teaching at Gray's School of Art in Aberdeen, Scotland. He built a home for his wife and child (my mother) in a small waterfront town called Kirkcudbright that, like Port Townsend, is considered an artist's town. When young, I did not enjoy art classes, felt frustrated and uncomfortable, and lost my pleasure in drawing. I gave up a college art major after 18 months, returning to school a year later to major in computer science. Art became a minor interest, and my efforts were limited to producing batik clothing for Christmas presents. In 1997, I left a well-paid job in Seattle, Washington for a more satisfying life in Port Townsend. Here my husband and I built a straw bale home. I found myself adding artistic elements to the house, learning to use power tools and construction scrap to make yard art, and painting a little. Once the house was built, I cautiously tried, and enjoyed, several art workshops and classes. I was becoming an artist. In 2005 I took both sculpture and painting classes in San Miguel de Allende, Mexico, at Instituto Allende and at Instituto Nacional de Bellas Artes. For many years I have attended an informal weekly mixed media art seminar (thank you! Maureen) when home in Port Townsend, and I have benefited from many workshops given by Northwest artists. I have had artwork accepted in several local juried shows, and in 2006 I put together my first solo show at a small exhibition space affiliated with a local art supply store. Since then I continue to spend time on art, working to satisfy myself and also the teacher of my weekly class. This seminar offers support, inspiration, and guidance in a very relaxed small group. I continue to enjoy working, and find the results of my work more satisfying. I continue to try to improve my ability to convey what I see and feel in my art. As a member of Corvidae Press, a local printmakers' guild, I have access to a great space with three etching presses, photo exposure units, and the basic space and equipment needed for any form of low-toxicity printmaking. I don't have formal training as a printmaker, but I am gaining experience and enough mastery of the basics to enjoy myself and take satisfaction from the resulting work. It is wonderful to have the use of this facility and to share the energy and information of fellow guild members. As a member of a cohousing community, I enjoy sharing some of my artworks at the community common house, and I enjoy lending works to organizations that don't need to, or don't have budget for, purchasing permanent collections.